After returning to Phnom Penh and having a couple days of rest and recreation, the crew is getting ready to head back home! The last few days have been a great time to hang out together and explore the city. A list of some of the enjoyable experiences we’ve had include the following: spending time at the market getting souvenirs and gifts for loved ones, hanging out at a small water park (with activities like swimming, water gun fights, volleyball, and tennis) and getting massages in town. With our bags packed, we’re getting ready for dinner and a long day of flying home ahead of us. Can’t wait to see you all at home! With the great fence project having come to a close, it’s time to move on to the next church home. After an eventful Sunday of blessings and sorrowful goodbyes, today’s 7 hour bus ride gave us a chance to rest, process, and talk to each other as we left the Thmor Da for the city of Pursat. After some relaxation we went to another church home, Prek Bey, and visited there for several hours, playing soccer and volleyball, sharing a meal, and giving testimonies. Tomorrow we make our way back to the capital, Phnom Penh. Here are some more photos from last week’s home! Bringing our long week to a close, the fence only needs a bit more time to be finished. Culturally (and particularly in Cambodia) a fence is a symbol and sign that you protect what you have. And when it comes to protecting these children, no fence is too much work. The day began with us joining the church in their Sunday service. Singing songs and hearing a short word from the pastor, we were invited to sing a worship song of our own with Karson and Yanna. This was followed by the first years’ second (and better) performance to “Shake It Off” for the kids! When service was done it became time to finish the fence. We continued to assist with the chain link and the brick wall at the front of the bus until it was time to prepare for the rest of the day. After a quick lunch break it was time to take the kids to the market. With each kid having a member of the group spending $25 on items of their choice, it made for a truly gratifying experience for everyone involved! Most of the children quickly went around the stalls, selecting items they wanted and knowing how much to pay for them. Though we encouraged them to buy things they wanted as well as supplies they may need, much of what was bought was life necessities. Som Nang, for example, mostly bought clothes and school supplies, and was excited to try on his new leather belt! After loading the kids on the bus and heading back to the church home, we had a chance to give encouraging words to the orphans, the pastor, and the church as well as pray over Pastor Tim’s back. Due to time being limited, not all of us were able to give words, but it was nevertheless an uplifting and hopeful time for all of us. We became very close to these orphans, and have come to love them as brothers and sisters. Having now grown such a close unity and closeness in our relationships with the church, saying goodbye was the hardest part of the trip. Nearly all the children received a polaroid photo to remember our time together as we hugged them all goodbye. In order to show our gratitude and assurance that we would see them again in heaven, we made sure to smile and be energetic when we said goodbye. Come back tomorrow for more updates! More sand, rock, cement, and hard work. Sickness, heat and more tiredness kept the team down a bit, but the job is almost finished. Many of the kids were at school for a good part of the day, but we made the most of the time we had with them. Feeling sick wasn’t enough to keep Bethany from coming to play with the kids for a while. Yanna gave many of the girls finger nail polish, making many male first years’ fingers gleam with beauty. With cement posts completed and the chain link began, the fence is close to being completed. Steven Thornton revealed his masonry skills, helping to build the brick wall with the Cambodians. We are excited to attend church at the home today, finish the fence and take the orphans out to the market. With the trip already halfway over, we are thankful for all that God has done and looking forward to all He’s going to do this next week. Stay tuned tomorrow for updates on the fence, sunday service, and market with the kids! Another full day of working with cement, and it’s had its effect on the team. Although we were generally more tired and sore today, some good weather and encouragement from each other kept us going! Our relationships with the kids have grown too. Everyone has a kid close by our sides for most of the day. With soccer, volleyball, and music bringing us together, every day is more fun! As usual, the kids could not have been more helpful. Some got waters for us, some carried tools, and some carried buckets. It's amazing to see the ownership they take of their home! Plenty of work got done! We finished laying the foundations for the fence as well as digging the base for a wall for the front. Thanks to the shoveling skills of Cody (with some help from everyone else) the day went smoothly. In particular two kids named Polim and Ren went out of their way to assist us with everything we did! With some dinner and verbal high fives (shout outs), we are back at the guest house getting rest to keep up the work tomorrow. Check the page tomorrow for more updates! As the title of today’s blog may have suggested to you, today involved cement, and lots of it! With the group getting into a routine, the work at Krava was more organized and efficient. Though the heat returned from its timely absence yesterday, we made sure to stay hydrated and give each other breaks, Yanna taking much of her break time playing games with the kids. The kids continued to assist in all the work, shoveling, moving wheelbarrows, and getting water. Finishing 30 forms and filling possibly more holes with cement, the team accomplished a lot, but still has a lot to do the next couple days to finish the fence. Come back tomorrow for more on the work project! 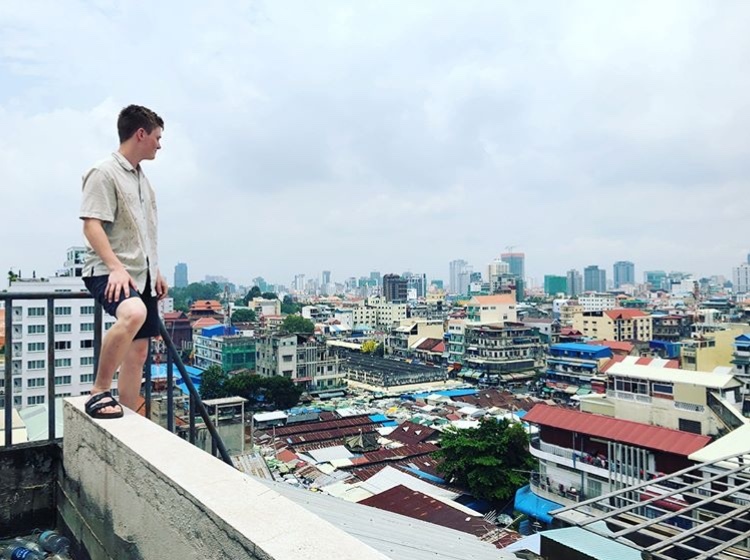 With a solemn goodbye to Hotel Cara and Phnom Penh, we departed for Krava, our church community center, where we would be beginning our work project. The bus ride took us through what is called "Spider City," where the group (Gabe and Allie in particular) experienced new foods like grasshoppers, crickets, maggots, and even a tarantula! After a few other brief stops we arrived at our hotel for the week, Thmor Da Guest House. Seeing most of the signs and papers in the room almost completely in Khmer was a friendly reminder we were no longer in the capital city. Next was to head to the home. An open gate and twenty or so orphans greeted us with friendly smiles and bows as we exited the bus. The people led us into their building where we sat to watch the children sing a couple songs. Eventually joining them in worship, we were again reminded that nationality, language and culture cannot prevent God’s people from worshiping him in unity together. The group was welcomed by the pastor of the Krava who thanked God for the extra help and made us at home in the house. We and everybody in the room had a chance to introduce ourselves. Next was the best part of the day. Work began with us all being divided into different jobs to help build the fence. Doing our best to assist the Cambodian people, they showed us how fence-building is done. We dug holes, built forms and rebars to support the fence, and, luckily, still had some time to play with the kids. Tired and sweaty bodies wasn’t enough to keep us from playing games and chasing around the kids for a while. Karson and others switched immediately from work mode to fun mode, playing tag with kids all over the property. A little more time with the kids and it was time to go. After some delicious dinner at a restaurant PiRom our bus driver found for us, we returned to Thmor Da to rest and recuperate for Day 3. Working the second day was longer, and thanks to rainstorms cooling us off, very productive. 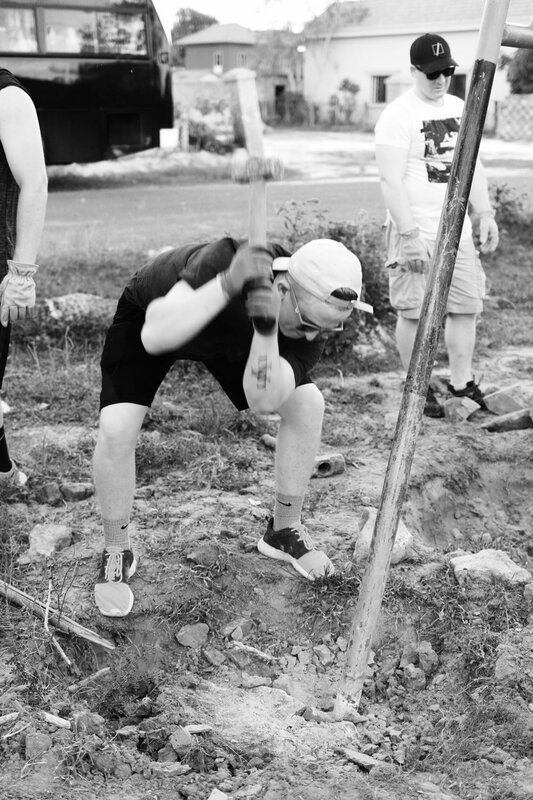 Over fifty posts were put into the ground due to the combined effort of the Cambodians and our group. The orphans could not have been more helpful as they also cheerfully worked with us, moving rocks, getting trash, and giving out water. After some dinner the group encouraged one another and got some rest at Thmor Da. Getting prepared for more work tomorrow, stay tuned for the next update coming tomorrow for Work Day 3! Another great morning at Cara Hotel where we set off for Kampong Speu Province, where various homes were meeting for a party to celebrate with all their kids. A couple of hours from Phnom Penh, the church had over sixty orphan children present for the day, most of which from other communities, some several hours away. We were welcomed immediately with a “Jiem reap sua” by friendly and loving adults and children we grew to love by the time we had to leave. The language barrier couldn’t stop the fun we would have! After sharing in some prayer and worship with the kids, pastors and other staff, the first years had the opportunity to perform their (thanks to Maddie) well-prepared dance to Taylor Swift's "Shake it Off." Naturally, only Brad had the song downloaded on his phone so we could dance with the kids. Lunch was amazing! We enjoyed curry and fish that the Cambodians generously prepared for us, along with some sweet coconut juice, straight from the coconut! Pastor Tim recommended that we tried to pour Fanta into a coconut to give it some extra flavor, but since Bethany couldn't find any she poured Coca-Cola into it and christened it "Coke-onut." Necessity is the mother of invention, they say. We spent the rest of the day hanging out with the kids. Dancing, soccer (with the professional Camron Masters), and coloring were only a few of the activities we spent the day with them. After a seemingly short yet unforgettable time with the orphans came the worst part of the day: saying goodbye. After taking countless polaroid photos the kids kept to remember the party, we hugged and waved them all goodbye as we piled back into the bus for Phnom Penh, where we (especially Yanna) spent time talking and encouraging one another. After some pizza and wings at The Pizza Company, with food indistinguishable from the best of American food, we got back to the hotel by 8:30. After all the running around with the kids, sleep was the only thing on our minds. Getting rest for our big work project starting tomorrow. Thanking God for a great day and excited for more. Keep checking each day for more! We had our first day in Pnhom Penh! We didn't need to know the Khmer language to know these people's heart for God and His people in their community. We worshipped with them and experienced the service, later being introduced to the staff and children on the property. In an experience Brad described rightly as "sweaty," we played tag, karate fights and "Quack-dilly-o-so" with the orphans of the church for an unforgettable hour! With many of our new friends tagging along, team lead Sam Tolle gave us a tour of the FCOP Training Center. We were amazed by their great work to provide for each other and the orphans, many of us buying some of their elegantly crafted purses and bags to take with us. All of the proceeds go into a college fund for the kids who made them! From the church we left for lunch at Mike's Burgers, an American-style restaurant with fries arguably better than most in the States. From lunch we left for the Toul Sleng genocide museum, where we were immersed in the remnants of a 1970's Khmer Rouge prison. A former high school, the facility was used for unspeakable kinds of imprisonment, torture, and dehumanization that words cannot begin to describe. We were soberly reminded of the presence of true evil in our world and were able to spend some time in thought about the events that have taken place in this country. After enjoying some rest and dinner at a local restaurant, we headed back to the hotel to catch up on sleep and prepare for traveling to different homes tomorrow, having an opportunity to connect with more people and possibly help out wherever we can. Everybody is healthy and excited to keep going on for what God has next for us! Yesterday we finished pouring cement for all of our posts. Overall we finished 79 posts which has been incredibly fast. It was probably the hottest and driest of all. You would work for ten minutes and then spend 10-20 minutes in the shade. Still, things moved quickly because we worked out a system and everyone knew their place in it. At the end of the day we made a long assembly line to pass buckets of cement to the last few poles and got to celebrate as our team coordinator Khemera poured in the last bucket. We finished early, which means we got extra time to play with all the kids. We broke out the Play Doh and coloring books, took instant print polaroid pictures that they could keep, and showed them pictures from our phones. We also got to spend a half hour cleaning up the property from garbage. We even had the children follow us during this time so they could learn how to take care of their home when we are gone. Today we get to take the kids to the market, give them prophetic words with an interpreter, and have a feast at their home! We are incredibly encouraged by all the Lord has done in and through our team and the trip is only halfway over! It is a daily reminder that He will continue to do IMMEASURABLY more than we could ever imagine if we choose to be obedient to where He leads. We managed to get done with 38 posts today, exceeding our goal by 3! Today was more hot and dry than previous days, and our team felt it. We took more frequent breaks, and broke out the aloe vera for sunburns. We're starting to feel the strain after three continual days of work, but we're also enjoying ourselves more as we have our jobs figured out and our relationships with the kids are flourishing. Today we got the test results back for the children and found out that none of them have Hepatitis B! We also finished vaccinating them, which means that they are safe from the disease. And not only that, but because Hepatitis B is generally inherited, the children of our children are safe too. The work we're doing here is literally changing generations. We want to highlight a girl at the home named Srey Phea (pictured below). She was born with Down Syndrome, and then when her mother died a couple years ago, her father abandoned her to start a new family. In this culture it is generally believed that a child born with any defect is actually cursed, so nobody would take her except Jaw. She understandably has a hard time with people. The first day we came to the home she hid in her room the entire time. On day 2 she interacted with us some. There was breakthrough on day 3 as we got her out of her room and dancing along to the songs on our speaker. Now on day 4 she interacts with and plays with everyone. Despite so much adversity in her life, she has the most joy out of everyone here. Our second full work day is in the books. We spent almost all of the work doing concrete again. The first half of the day we made concrete for the fence posts. This was even more of a process because our piles had to be twice as big, and we had to mix them by hand rather than pouring them into a hole along with water. Still, we managed to fill 23 posts with concrete, which is excellent for a team our size. Today, if you saw us with the kids you would not believe that we met them all just two days ago. We play games, pull pranks and do piggy back rides. We also got to play musical chairs with the kids, which they absolutely loved! Yesterday was a big day for the kids, as they got blood drawn to check for different illnesses, such as hepatitis. This is a big deal and very important. When the medical team is aware of it, they can take the right precautions for those who have it and vaccinate those who don't. A common phrase on this topic is, "the answer is in the blood." They don't take this lightly, and it was very encouraging to see how much the Cambodian team cares for these kids! We're starting to get into the rythm of things as a team. One special thing we do every dinner are "verbal high fives," where anyone can stand up and point out something positive someone did that day. The first night we did it there was some participation, but now there are dozens of shoutouts every time. Today, we have 35 more posts to fill, which is hard but possible. It's going to be a good day. Our first full work day complete! The day started with some worship and prayer time in the sanctuary at Jaw church home. The kids were still a bit shy, but not for long. As soon as we were done worshiping the whole property began buzzing with activity. As you can imagine, building a fence made to last is a process, especially with no machinery. We finished digging all of the holes we needed for fence posts. Then we placed large rocks around every hole in order to stabilize the post. After that it was time to mix cement. Here in rural Cambodia concrete happens a little bit differently. You make a giant pile consisting of one wheelbarrow of small rocks, two wheelbarrows of sand, and one bag of concrete mix. You use a team of four shovelers to move the entire pile over a few feet. Then you move it all back. This mixes the concrete. Then you shovel it into small buckets and walk them to every hole in order to be poured in along with water. Altogether we did 48 holes, not bad for a day's work! We spent the last half hour relaxing and playing with the kids, who have become fast friends with us. One highlight was how we spent our lunch letting the children write and draw in our journals. It let us express ourselves to each other in a way we couldn't with words, and given us something we can take home and look back on. We're all tired out now, but it's the best kind of tired. We wouldnt want it any other way. Once breakfast finished, we hopped on the bus bound for the FCOP Training center for church. Sam acted as our guide during the ride, explaining some of the history and aspects of the culture as we got our first good look at Phnom Penh. One might experience culture shock on the roads here as drivers have little regard for right of way or personal space. Church service was in certain ways very similar to what you might see at Living Water: A three guitar band, three vocalists, and a three song lineup. Close of worship, offering, a sermon, and response/ministry time to conclude the service. 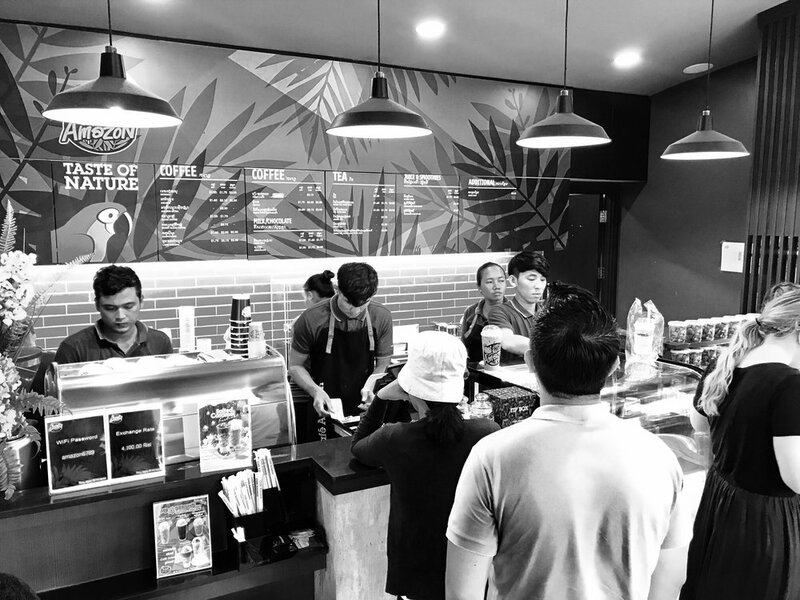 The differences were that the entire service was conducted by the Cambodian people in their native language, and everything had more fluidity than your typical service back in the states. For example, many of the congregants didn't leave until an hour after service because a torrential downpour flooded the entire grounds. We used the time to introduce ourselves to and play with the children around the home. There were tearful reunions and new beginnings all around. After a brief tour of the training center (while things dried out) we got back on the bus to a little place called Steve's Steakhouse. If the condiments weren't partially labelled in Khmer then you might mistake this for an American restaurant. The owner, Steve Billington, has a good relationship with Foursquare Children of Promise, the organization we are serving with. Over 50% of our orders were for cheeseburgers. Our lunch time was rounded off by a trip for coffee in one of Phnom Penh's cafés. Of course, in 92 degree weather we're all opting for iced. We're all gathered around a long breakfast table at our hotel in Phnom Penh. It's the first time since boarding in Seattle that we have all been able to sit down and converse face to face. Our first flight was a long thirteen hour cruise up the west coast of Canada, along the Aleutian Islands, down Asia's East coast, and finally into Incheon, a port right outside of Seoul, South Korea. If you asked any one of us what they thought of Korea they would say "I don't know, it was mostly a blur." Our connecting flight was scheduled to take off just half an hour after our first flight landed! We sprinted through the airport in three minutes, escorted by a very athletic flight attendant who put us all to shame in terms of speed. Compared to the first flight, the second one into Phnom Penh was rather uneventful. However, once we landed in Cambodia, you could tangibly feel the excitement. People who had been on this trip before couldn't wipe the grins off their faces. We passed through customs without a hassle and discovered that we need to wait one day for our suitcases to catch up with us. Thankfully, we have enough supplies in our carry ons to last us, and a nearby convenience store to fill in the gaps. Sam Tolle and Pastors Tim and Dhana Wimberly greeted us right outside the door and saw us to our hotel after greeted us all with handshakes and hugs. Checking in went smoothly, and at 1:00 a.m. following 24 hours of continuous transit, sleep came easy. Today we're looking forward to church, lunch at Steve's Steakhouse with Ted Olbrich, a museum tour, and more.